If we're going to have any hope of preventing catastrophic climate change, the vast majority of our remaining fossil fuel reserves are going to have to remain where they are -- in the ground. One thing that can make a huge difference toward that end: the U.S. government could stop leasing out federal land for fossil fuel production. A blanket ban on this process could prevent an astonishing 450 billion tons of carbon dioxide from polluting the atmosphere, according to a new report. (For comparison, the world emitted about 38.2 billion tons of CO2 into the atmosphere in 2014.) 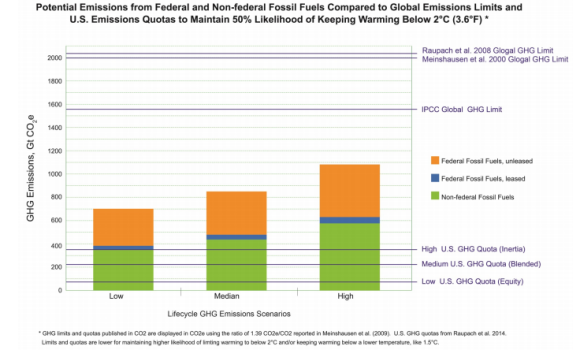 The analysis, performed by EcoShift consulting on behalf of the environmental groups Friends of the Earth and the Center for Biological Diversity, found that nearly half of the total amount of the United States' potential emissions are accounted for by fossil fuels located beneath federal lands. The vast majority of this land hasn't been leased for development -- yet. And the study makes a strong case that it should stay that way. If you account for the land that has been leased combined with other sources of fossil fuels, it found, the U.S. has already exceeded the amount we can burn if we want to have even a 50 percent chance of keeping global warming below the agreed-upon limit of 2 degrees Celsius. The remainder is, from a climate action perspective, unburnable, and the report's sponsors argue it should be treated as such from a policy perspective, as well. Federal land leases to gas and oil companies do happen to be one the government's largest sources of non-tax revenue. But they're also really only a good deal for the gas and oil companies: as a recent report from NYU's Institute for Policy Integrity found, the government is practically giving this land away, at incredibly low prices that don't account for inflation or the health and social costs of fossil fuel production. If anything, the report's author argued, the price these companies pay should reflect those true, and much higher costs. This new analysis is making the argument that, at this point in the climate crisis, any price would be too high.